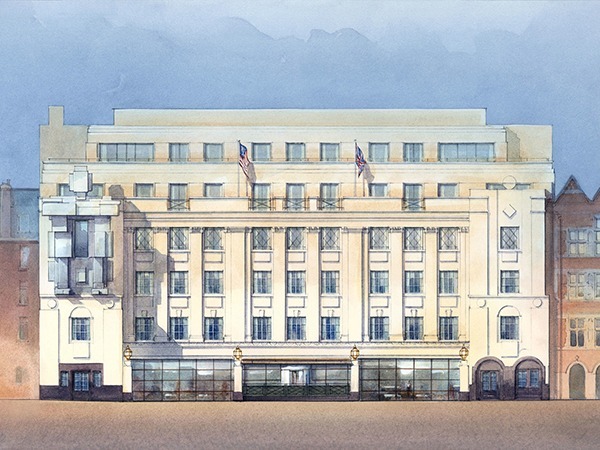 Set to open in Autumn 2014, The Beaumont will feature interiors from Richmond International, aiming to encapsulate the elegance and glamour of pre-war Mayfair. 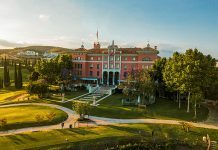 The hotel will offer 73 guestrooms, including 23 suites, as well as a classic grill restaurant, a traditional hammam and treatments areas an a resident’s gym. The interior design has been realised by Fiona Thompson, Principal of Richmond International and her team, in close collaboration with Jeremy King, ReardonSmith Architects and Grosvenor. As with all Richmond projects, the interior is inspired by the building and its surroundings. Originally built as a car garage in 1926, the Grade-II Listed building by famed 20’s architects Wimperis & Simpson offers a pure Art Deco style. Overall, the design challenge was to create the ultimate 1920’s inspired hotel, capturing the charm of the Art Deco era. Research was carried out into materials, patterns and textures, in order to create a detailed and accurate evocation of the rich aesthetics of the time. Antique and vintage pieces, as well as original works of art, posters and photographs sourced over the years by Corbin & King are placed throughout the public spaces and suites. Richmond International have also worked with a number of selected independent, high-quality manufacturers for the creation of bespoke furniture, mostly based UK. Floor-to-ceiling steel windows run the full width of the of the building, while the main Lobby and reception features a checked black granite and gold travertine floor, with a curved back wall in Cherry leading through to the bar and restaurant beyond. Food and beverage areas are an integral part of the hotel, with The Colony Grill Room and the American Bar forming the central hub. 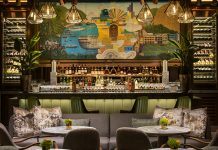 The classic Grill Room is on two levels, surrounded by specially commissioned murals and an eclectic collection of artworks, with an ornamental stained-glass roof light overhead. The seating area features blood-red leather banquettes, 1930’s bentwood and studded chairs. Behind a partition, the American Bar sits, featuring warm, bespoke period furniture in deep browns. The Cub Room is an exclusive bar and lounge, with walls and ceilings lined in a European cherry wood with strips of bronze, a handmade Art Deco carpet in taupe and brown, and a varied mix of original and bespoke chairs. Inspired by the Turkish Bath at the quintessentially British membership club, Royal Automobile Club in London’s Pall Mall, and by the iconic New York YMCA late 19th Century building, the Hammam and Spa is dressed in small black and white marble mosaics, a circular marble plunge pool back with small silver tiles, heated relaxation slab, two treatment rooms and a relaxation area. The bedrooms and suites exude luxury in pure, but softer Art Deco style, with polished rosewood wardrobes and sliding room partitions. 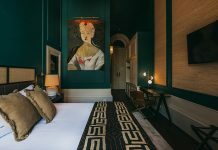 The timber headboards complement the bronze mirroring, mohair velvet chairs, geometric wool carpets, bronze handles and original of-the-period artwork and photography. Marble, chrome and glass feature heavily throughout the bathrooms, where floors with black and white marbled mosaics create geometric patterns. The Presidential Suite is located on the top floor. A sophisticated and comfortable ambience is created with patterned silk curtains, handmade rugs and period antique furniture. The room is complete with lacquered white panelling, with feature brass inlays and parquet timber flooring. A particular feature of the hotel is Antony Gormley’s ROOM, a suite in the form of an inhabitable sculpture by the artist. The steel figure was unveiled in June 2014, and overlooks Brown Hart Gardens in the heart of Mayfair.